We all know they key to being a successful business is to sell more. But we'd be wrong. 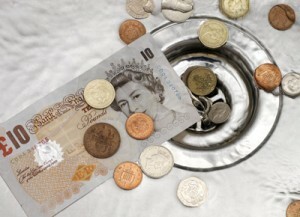 Most business owners are pouring money down the drain. Here are 8 things you can do to make your business perform better and make more profit. Each can make a substantial difference to your business's performance. Taken together they can be transformative. This is one of the biggest causes of low profit and business failure. It is that important. Business critical decisions have to be based on robust information and an understanding of the impact on both sales and costs. Decisions such as what level to price at, where to spend and where to cut back, whether to take on a job or buy a new piece of equipment or whether to outsource. Get these decisions wrong and at best you make less money than you should. I'm often amazed how little grasp even well informed business owners often have of costs. As a first step put together a customer/product profitability matrix - this can be eye opening and will show you where to focus. Any discount you give goes straight to the bottom line. And there is often no visibility of discounts given. If you don't measure it you can't manage it. Sales people are generally rewarded on sales. One of the easiest ways to get sales is to sell on price - to give discounts. Discounts are like a drug. Once you have set customer expectations it is diffcult and expensive to change them. One company I know had to pay several £m to buy back discounts which previous management had granted to a major customer. - make sure your accounts show discounts. - degradation and obsolescence. Some products have a sell by date, some such as fashion or electronics becomes out dated. All product looks less attractive the longer you hold it. In both cases you are unlikely to be able to sell at anything close to intended price. - write off and disposal costs - you can no longer sell the product and often need to pay to dispose of it. Against this you need to balance the missed opportunities of not having an item in stock when needed. What you can do: tightly control stock at an item level. Ensure ensure good rotation. Look for slow sellers and if necessary clear them. look for fast moving items and ensure you don't run out. Estimate the value of sales missed through lack of stock. 4. Tighten your management of debtors (accounts receivable). Credit is often needed to do business. So you may need to give credit. But once you have agreed credit terms there is no excuse for not collecting it on time. Money your customers owe you is money you need to find and money you can't use for other things. But it goes well beyond this. For every 30 days a debt is late, the chance of collection goes down by 50% and the effort to get it doubles. I have seen very few companies who manage credit well and some being close to failure as a result of poor credit management. - confirm with your customer that they have received goods/services as agreed. - reconcile your account with customers at least annually. In nearly all organisations complexity proliferates and accumulates over time. The costs of managing complexity may not be obvious but are huge. It consumes time, resource, focus, energy and opportunities. Complexity increases exponentially with each new element, with each exception or special case. Complexity prevents you understanding what is going on in the business so you are less able to make good decisions. It makes your business less agile and less able to do new things. It is the enemy of good execution and a thief of profit. - always look for how you can simplify. Always challenge yourself to cut out things that are not adding value. 6. Ensure your processes work from end to end. All businesses are a collection of interconnected processes. Your business has processes whether you you like it or not. The success of your business depends on the quality of these processes. Most processes span several functions. This is where the problem starts. Function owners will tend to optimise their function at the expense of the process. The result? Poor customer service, lost opportunities, low staff motivation, fire fighting and increased cost. All leading to lower profits. - ensure people are aware of the end result you are trying to achieve. - follow the process from beginning to end to see where it is not working. Put in different real life examples and exceptions. - ensure incentives encourage cross functional co-operation. 7. Manage your staffing levels effectively. In a retail or restaurant business staff costs can be the single biggest expense. Demand fluctuates by day or hour. It is often difficult to predict leading to over staffing or over stretched staff. As a supervisor or manager it is in my best interest to have more staff than I think I need. In manufacturing businesses, managing this according to demand can make a dramatic difference to the bottom line. In a consulting business you need to be aiming for a 70-80% utilisation level. - Compare staffing number and cost against activity for each day. - Make supervisors/managers responsible for staff costs as % of sales revenue. - Help your supervisor to plan staffing levels based on historical patterns. - Look at flexible staffing arrangements where appropriate. Your two biggest costs are staff (7) and what you buy. Most business owners fail to manage purchasing or see it as a value adding function. There are two aspects - buying the right things and how well you manage your buying. Buying the right things - make sure that every purchase is aligned with your business goals. Management of buying - first ensure that you are buying competitively. Your decision should be based on value and fit. Only with commodities should you base on price alone and even then there are often other factors (eg service, guarantees etc). Secondly make sure that you pay for what you received, that it matches what you have asked for (ordered) at the price you agreed. Simply by matching order, receipt and invoice you may be able to find substantial savings. 9. Ensure you have strong management information. - comparable - you need to be able to see how things have changed. - timely - as close as possible to the events. Tip - Annual accounts produced 8 months after the year end do not cut it. - understandable - you have to have information in a format that is easy to understand and makes it easy to see what's going on. - granular - allows you to slice and dice to find the reasons for differences. For example cutting your business by sector, product type, geography etc. Without investing in good information capture and collection you will never be able to make as much profit as you could. Contact me to see how I could help you to make your business more profitable. This entry was posted in Blog Posts, Financial Operations, Sources of Profit leakage and tagged budgets, control, cost management, Credit Control, discounts, profit, purchasing, systems. Bookmark the permalink. ← Is money really the language of business?